I love chicken fajitas but wanted to avoid using my stove to make them because it is so hot outside today. 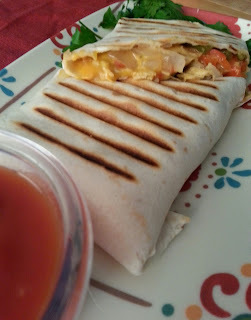 I decided to make chicken fajita wraps instead. I cooked the chicken in my crock pot and then assembled the rest of my ingredients, rolled them up in a tortilla and grilled them in my panini press. Easy peasy! In a bowl combine shredded chicken, salsa, and cheese. Onto center of each tortilla, spoon about 1/2 cup of the chicken mixture and veggies. Fold top and bottom ends of each tortilla about 1 inch over filling; fold right and left sides over folded ends, overlapping. Arrange two wraps onto Panini press and cook for about 3-4 minutes or until cheese is melted and tortilla is brown and crispy. Enjoy!